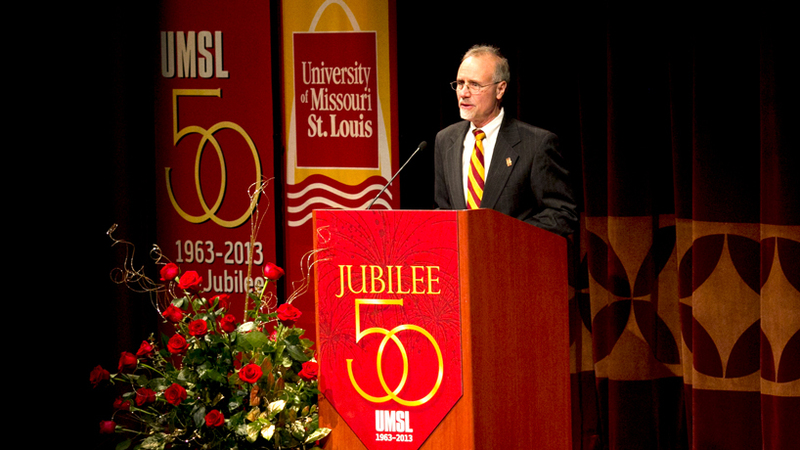 As the longest-tenured chancellor in the history of the University of Missouri–St. Louis, Tom George has been at the helm for momentous occasions and distinguished visitors in addition to the interactions that make up the day-to-day operation of the university. With George announcing his retirement effective Sept. 1, UMSL Daily is celebrating George with some images from his 16 years at UMSL. 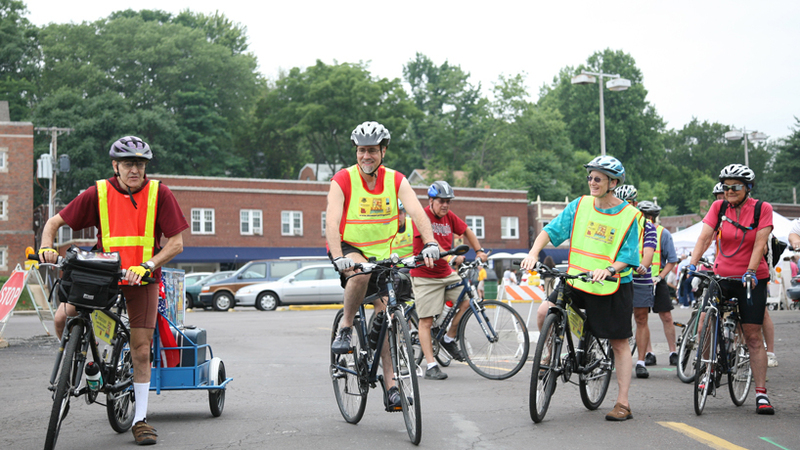 An avid bicyclist, George took part in this ride in June 2007 to benefit the Ferguson B.I.K.E. Project, which sought to improve the air quality around the community by encouraging people to bike to their destinations instead of driving. 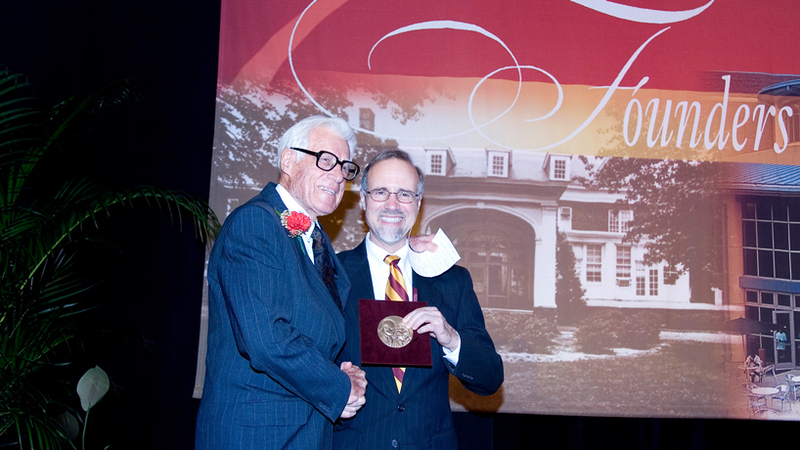 George presented Whitney R. Harris, namesake of UMSL’s world-renowned Whitney R. Harris World Ecology Center, with the E. Desmond and Mary Ann Lee Medal for Philanthropy at the annual Founders Dinner in September 2007. 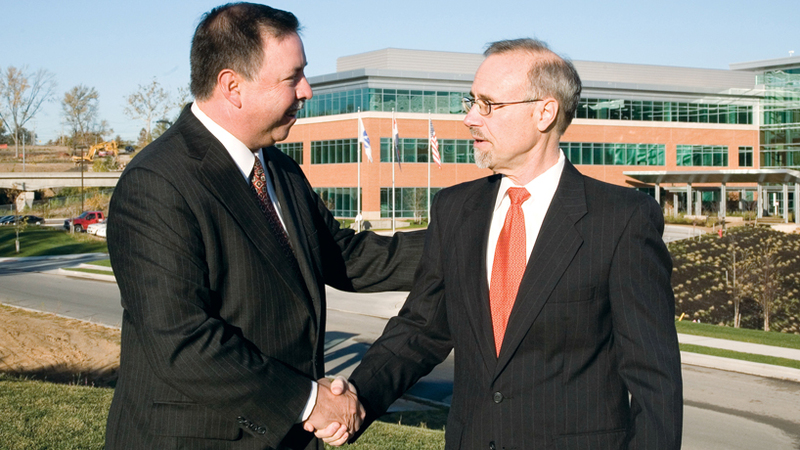 George Paz (BSBA 1982), who retired as chairman and CEO of Express Scripts in 2016, brought the headquarters of the Fortune 100 pharmaceutical company to the UMSL campus in 2007. 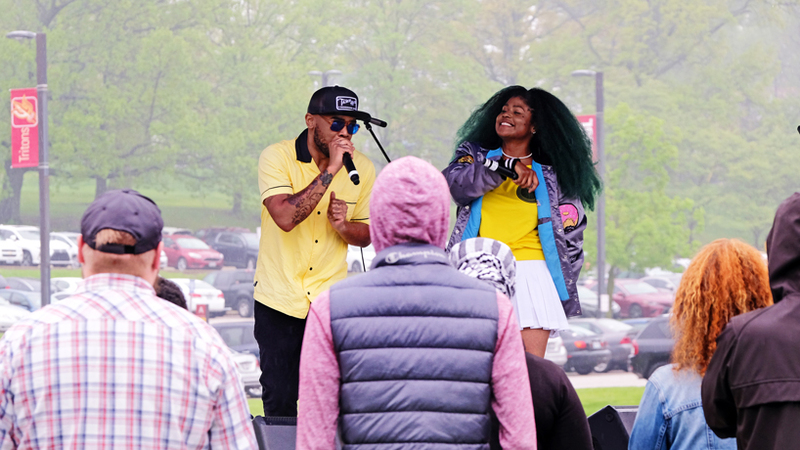 The partnership with Express Scripts blossomed under George’s watch, including the company’s support of the UMSL Bridge Program and scholarships for students. 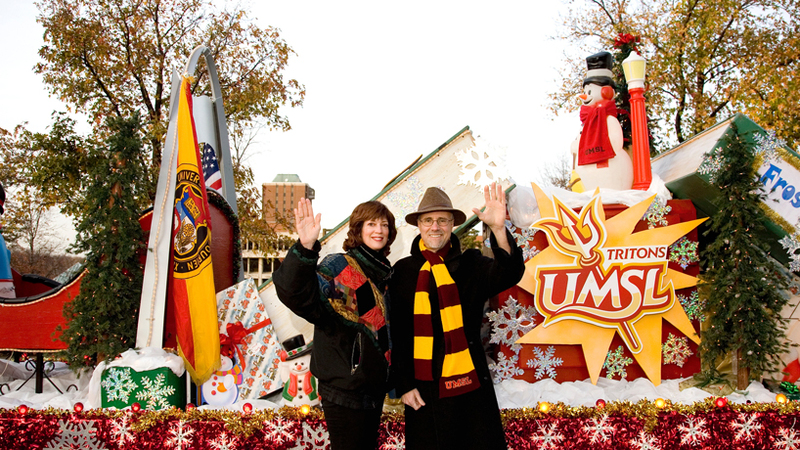 George and his wife, Barbara Harbach, posed in front of a holiday display on campus in December 2007. 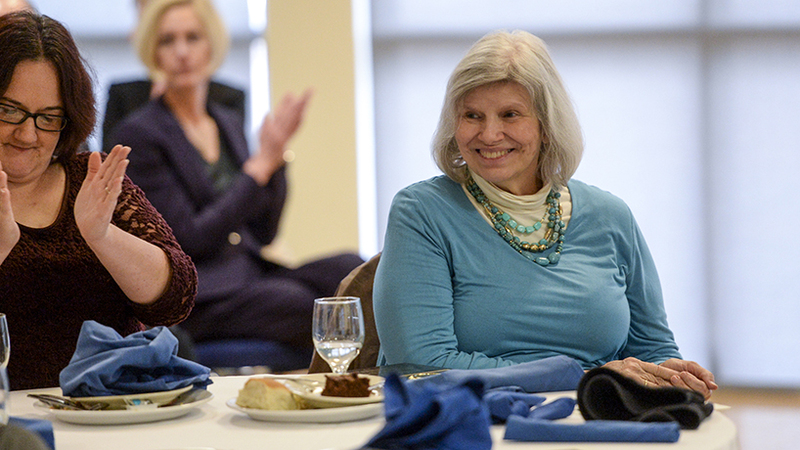 Harbach, who worked alongside George as Curators’ Distinguished Professor of Music, chair of the Department of Music and director of the School of Fine and Performing Arts for the past 16 years, is also retiring from her UMSL positions in the fall. 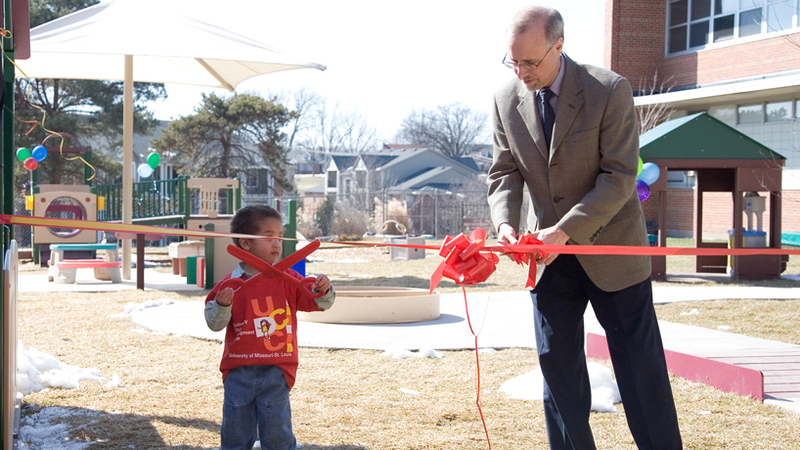 At a playground dedication at the University Child Development Center in March 2008, George gave some ribbon-cutting pointers to a youngster. 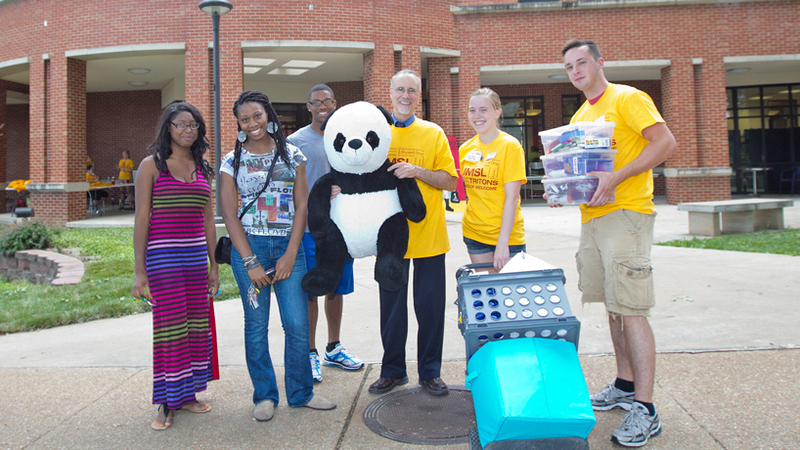 The UCDC has been a valuable child-care resource for UMSL and its surrounding communities. Rev. 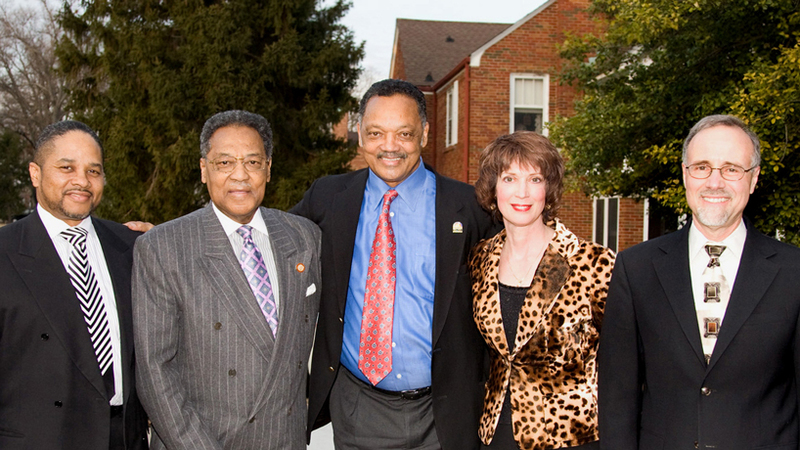 Jesse Jackson (center) visited campus in February 2009 as part of UMSL’s Black History Month programming, along with (from left) Rev. Ronald Bobo, longtime pastor of the West Side Missionary Baptist Church, and Henry Givens, who served as president of Harris-Stowe State University from 1979 to 2011. 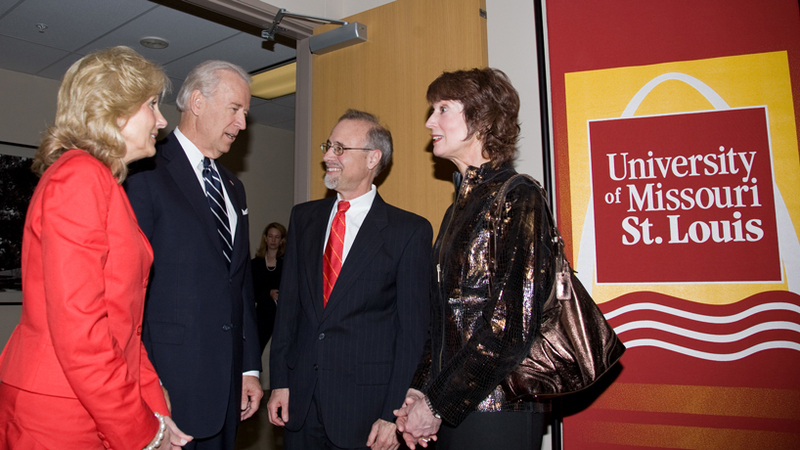 Two months later, in April 2009, George and Harbach met with former Vice President Joe Biden and his wife, Jill, when Joe Biden was on campus for a speaking engagement. 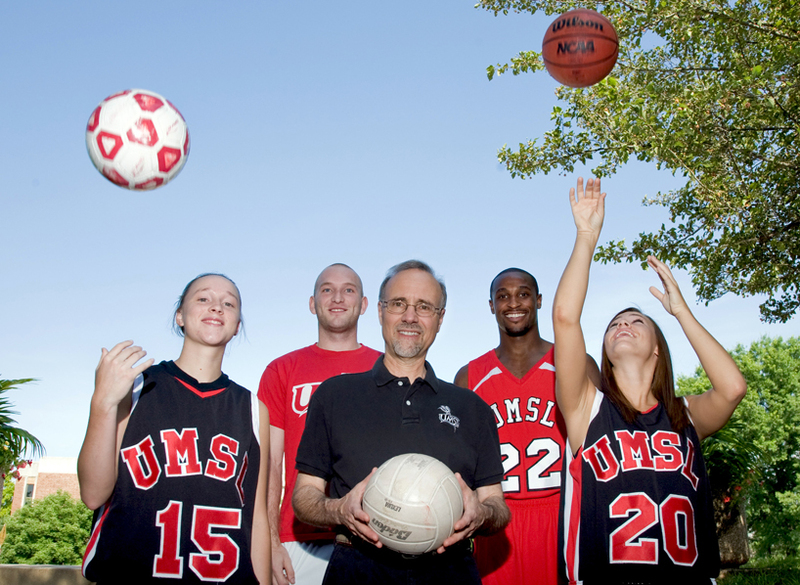 An ardent supporter of UMSL Tritons athletics, George posed with student-athletes in summer 2009. 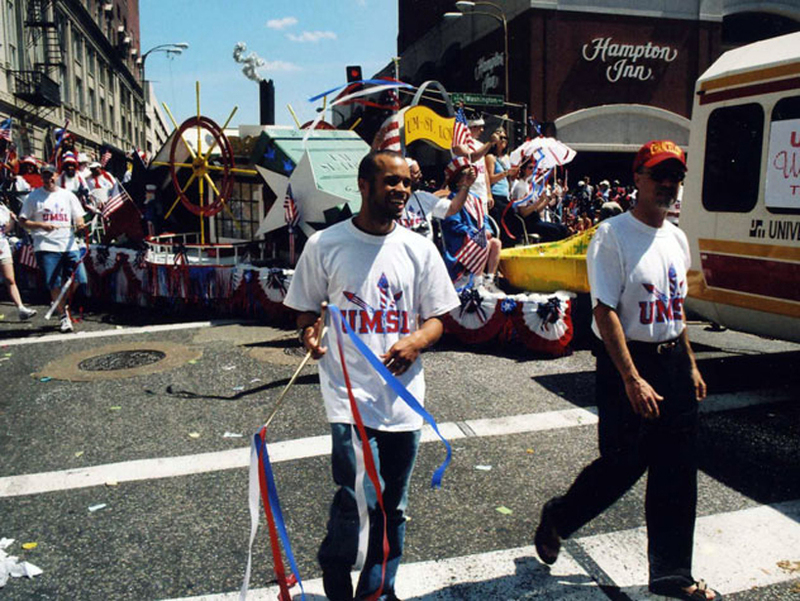 George has also served as a professor of chemistry and physics during his time at UMSL. 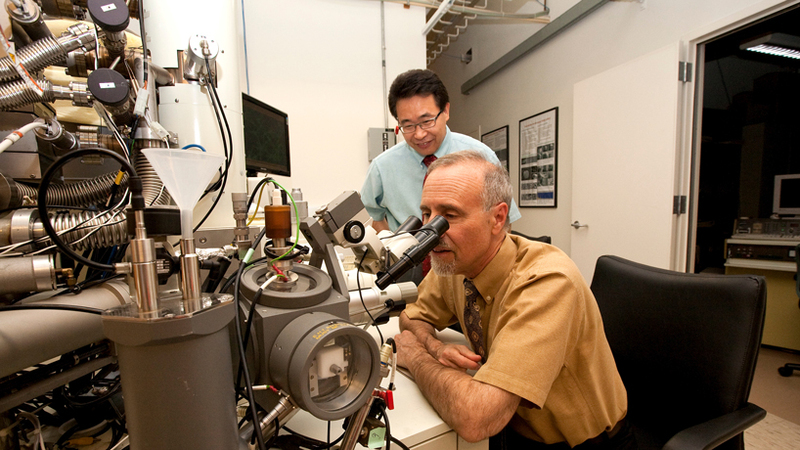 A bachelor’s, master’s and PhD holder in chemistry, George was in his element at the Center for Nanoscience in July 2010. A true renaissance man, George is also an accomplished pianist. 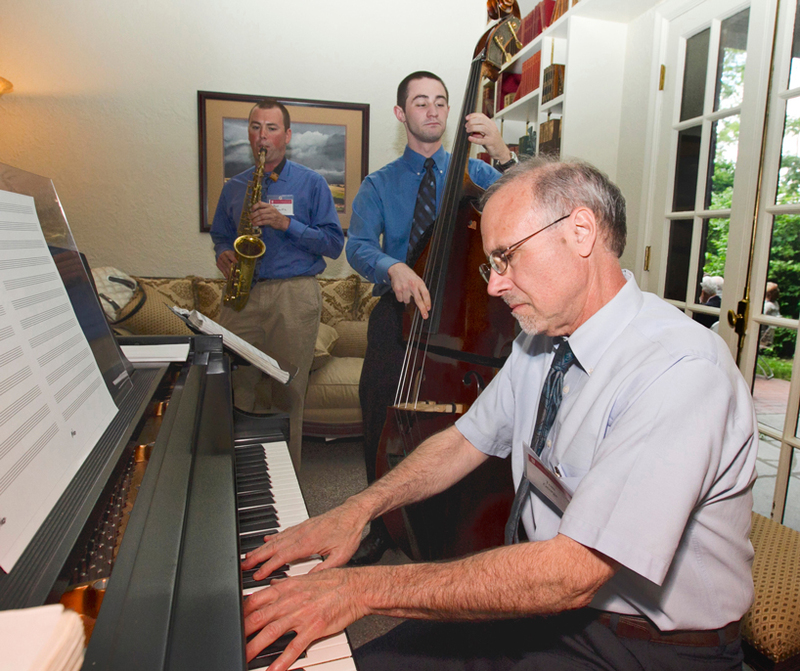 He took time out for a jazz jam session with students Tom Schultz and Matt Clements in June 2011. 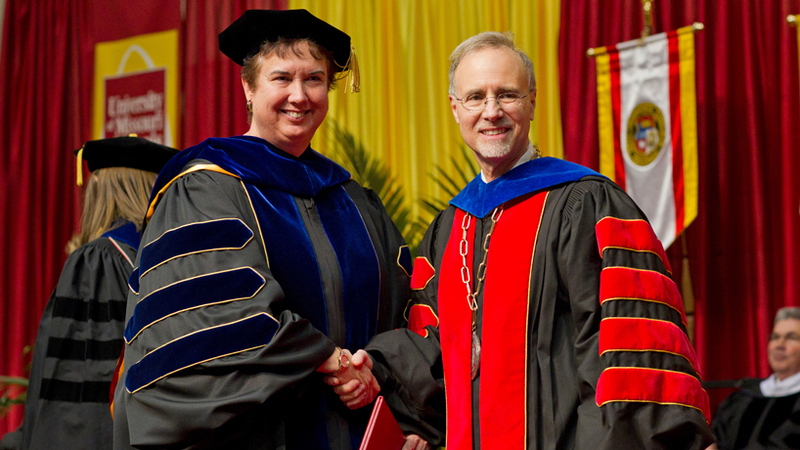 George congratulated Ann T. Piening McMahon after she received her doctorate in education in December 2011. 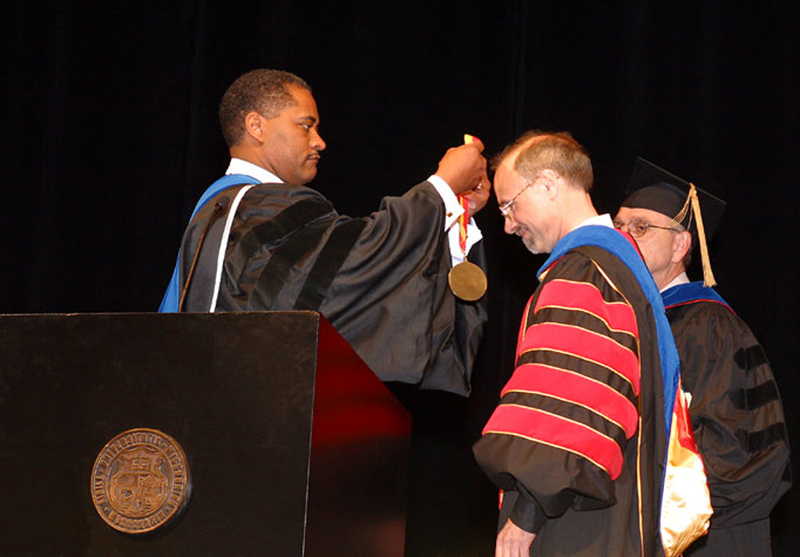 UMSL has awarded 44,820 degrees during his time as chancellor, including to 100,000th graduate Marco Pipoly last spring. 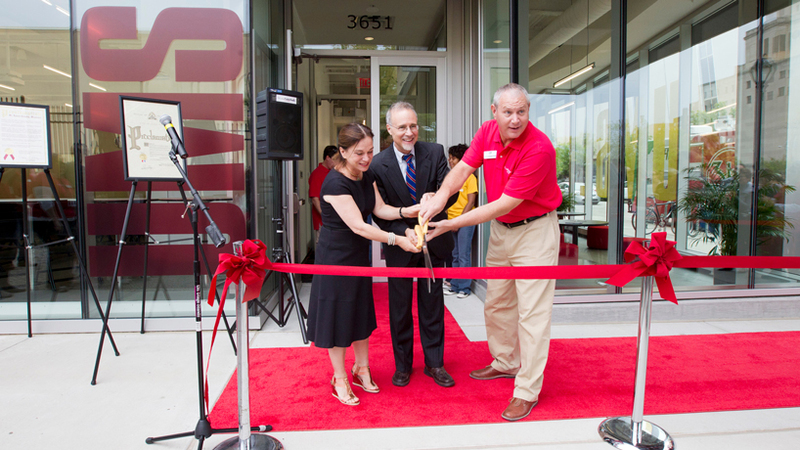 In September 2012, UMSL opened a new home for St. Louis Public Radio | 90.7 KWMU at Grand Center. George was on hand for the ceremonial ribbon cutting, along with NPR “Morning Edition” host Renee Montagne and St. Louis Public Radio General Manager Tim Eby. George has always been willing to lend a helping hand to students, as he did on Move-In Day before the fall semester in 2013. 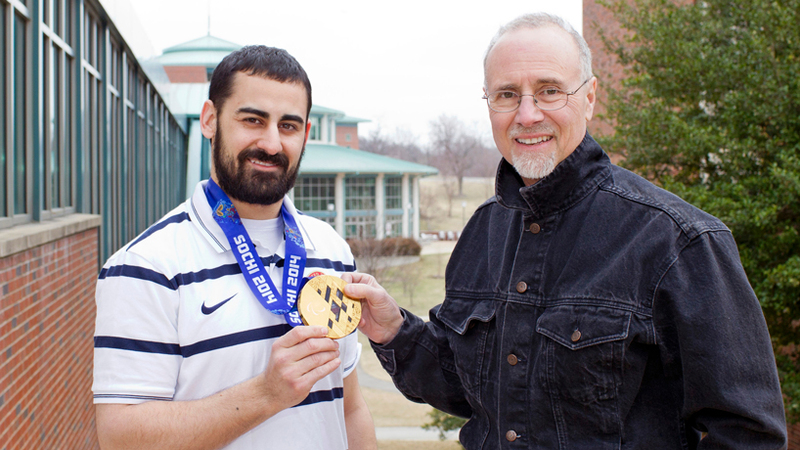 Steve Cash, a 2015 alumnus, was a business administration student at the time he showed George the sled hockey gold medal that he earned at the 2014 Paralympic Games in Sochi, Russia. Surprise! 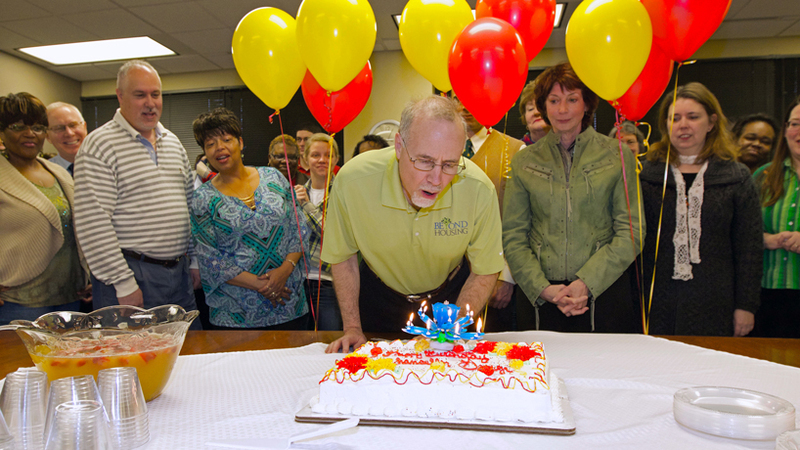 UMSL faculty and staff members threw the chancellor a party for his 70th birthday in March 2017. 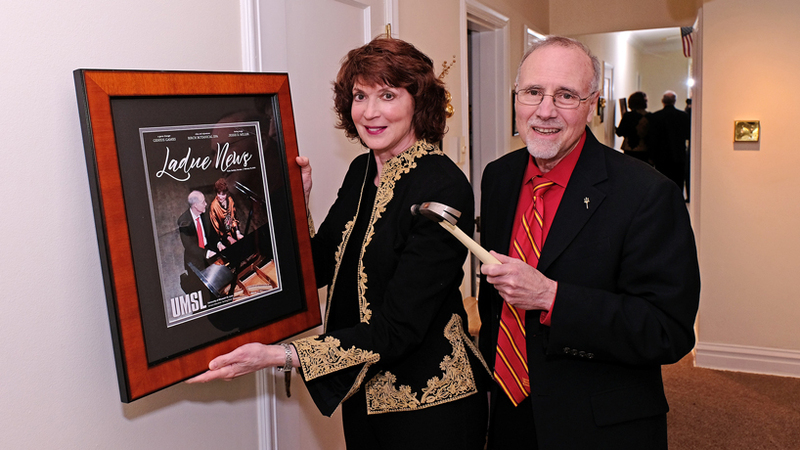 George and Harbach celebrated their cover treatment from the Ladue News by hanging a framed version of the cover in their residence in April 2018.